Comfort in the ocean requires separate skills from scuba skills. If you are not comfortable in the ocean, Nautilus recommends regular swimming, snorkeling, kayaking and floating in the waves to become accustomed to the rhythms of the ocean. 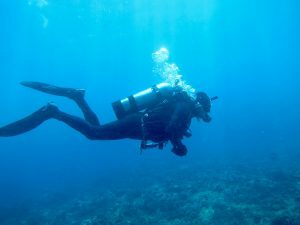 It is pretty easy to learn scuba dive if you are comfortable in the ocean. Take the time to develop your water skills and learn to relax in the ocean before attempting certification, and you will learn faster during training. When you register for any of our full courses, you get a $30 credit toward equipment purchases. Enjoy learning to Scuba in the warm clear waters of Hawaii. Let our professional instructors guide you while you experience the beauty and the thrill of diving. It's safe, easy and fun! Our small groups are usually private or semi private and ensure personal attention. Learn advanced diving concepts like Underwater Navigation, Deep Dive, Underwater Photography, Search and Recovery and Peak Performance Buoyancy. We can also provide PADI Specialty course certifications. Please inquire for details. Sign up for "Get Wet Today" Introductory Dive" (PADI Discover Scuba Diver Program) $85 per person: No Experience Necessary, No Certification Needed! Take an Introductory Dive for those who want to try scuba diving without committing to a full class program. Still need to make a few dives to complete your PADI, NAUI, or SSI certification course? Nautilus Dive Center accepts referrals from most training agencies. Nautilus offers more advanced PADI Training classes: PADI Rescue Diver course, PADI Dive Master Course, PADI Specialty course, PADI EFR course. PADI ReActivate program which is for the certified diver who wants to review the knowledge and in-water skills.